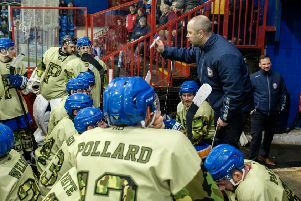 Peterborough Phantoms coach Slava Koulikov admitted his side’s English Premier League play-offs annihilation of Sheffield even took him by surprise. The city men launched their challenge for end-of-season honours with a 12-0 romp against the Steeldogs last night (March 22). Incredibly, they only had one more on-target attempt than their visitors, but were in ruthless form with imports Darius Pliskauskas and Petr Stepanek bagging four goals apiece. “I didn’t expect a scoreline like this,” admitted Koulikov. “But the main thing is winning our first game and picking up the two points. “It was a very good performance from all of the guys. You don’t win a game 12-0 if everyone isn’t playing well. “We could not wish for a better start to the group and it is a great response from the guys after the disappointment of losing in the EPL Cup final a few days ago. The drubbing of Sheffield was the first of six games in 12 days as Phantoms did to qualify from Group A to reach the finals in Coventry over the weekend of April 8 & 9. They now travel to league champions Telford this Saturday (March 25) before hosting reigning play-off champions Guildford the following night (March 26). Guildford won 3-0 in Telford last night – a result which means the Tigers can’t really afford to slip up against Phantoms. “Telford are now in a pressure situation,” added Koulikov. “I know they will not want to lose their first two play-off games at home. “It would not be impossible for them to qualify for the finals if that did happen, but it would obviously make it very tough. Phantoms have a slight injury concern over defenceman Robbie Ferrara who took a blow to the wrist last night.